Robin and Andrick begin to get ready for the video shoot. Have you ever worked in an office where you are told to do something, you spend all week getting it done and then you never hear anything about it again? Ever? If you are like the millions of Americans who work a daily grind kind of 9 to 5, this is probably your reality. Well, I hate to brag, but one of the many perks of my job here at PetSafe is being able to see a project through from beginning to completion. How do we take an idea and make it something worth your while? It all starts with the product. 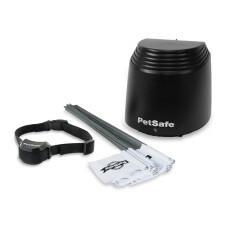 By now you have probably realized that we make a lot of products for your pets. From in-ground fences to pet proofing, we want to make sure your pets are covered. So when there’s a product we want to promote to further the relationship between you and your pet, we want it done right. Once we have the product ready, we all get together to think of the best ways to tell you all about it. Usually the best way to tell you is to show you. This brings me to one of my favorite parts of the job: The video shoots. Our video shoots aren’t just a bunch of people sitting around a conference table in suits while some random person is out there doing the work for us. We use our own videographer, writer and creative team to bring you the best way to describe your new product. We pick out an appropriate location, find the talent (dogs and cats that are usually paid in treats and toys) and start working. We have this great product out there called the Pet Loo. We recently brought in the product’s inventor, Tobi Skovron, and had some fun shooting a video for our PetSafe customers. The Pet Loo by PetSafe is a great fix for apartment dwellers, indoor pets and even senior pets that just can’t get outside in time to do their business. So when we started to think of great ways to present this to our wonderful consumers, we thought it’d be best for you to hear from Tobi himself. Tobi and Robin, our Senior Brand Manager (and dedicated PetSafe cheerleader), chatted about this great product, and gave an honest description of everything you as the consumer will get out of it. 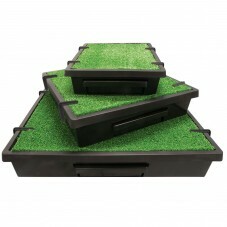 They talked about the synthetic grass that your pet will love to use, the unique design of this product and the great line of accessories we have to offer. Robin and Tobi chat about the benefits of the Pet Loo by PetSafe. Once the fun of the shoot was over, the footage was taken to our super-secret videography lab for editing. Well, not really. It’s always edited by our amazing videographer in our office (the office that is filled with cute dogs), and then posted on our YouTube channel for the world to see. It’s such a great feeling when we see our products go from just an idea to a store’s shelf. The photos, writing and videos that accompany those products are always exciting to create, and it’s an even better feeling to hear about the pets that love these products. We know your furry friends are going to love the Pet Loo by PetSafe, and we hope that you enjoy all of the cool videos and photos to come!